Could I be the new Chipendale ? Probably not but I've finally taken the first step with my first class in furniture making. It's taken me two terms to get into the classroom, it's a popular course, and probably a year faffing around meaning to enrol and doing nothing about it. I'm not one of those serial attenders at evening classes. Some people always seem to have one on the go, often trying to tick off courses like a trainspotter ticks off locos in his Ian Allen. A few years ago I tried watercolour painting for beginner. That quickly proved to be watercolour painting for people who've done this course several times and are actually quite good - I bailed out after three weeks when it became apparent I had no talent and was holding the other two "beginners" back. Since then I've welded for 6 weeks which worked much better as this was mostly practical and carried out in individual welding booths where you could have a go and no one watched. From this I discovered that MIG is OK, gas is fun, Arc just a way to stick to the bench and TIG a great way to blow holes in metal. Furniture making falls a bit between the two. Yes I am the only beginner. Of the three new people, one has done the course on another night already and just transferred for convenience, the other has done some serious woodwork in the past. And me who won't admit to much on the grounds that I probably do it wrong and have come here to find out how to do it properly. My first piece will be a frame. Nothing exciting, just 4 bits of wood joined in a square with 4 different joints. It's a test piece to get me through the basics. After all, if you can't join the wood together you can't make furniture ! Anyway we don't get to start with nice planed wood from the DIY store - or even that wonky stuff that our local sheds provide. No, we are issues with a square-ish lump of tree and get to cut it down to size. This means using big machines that can KILL YOU TO DEATH. After a quick tutorial I'm conversant with the cross saw (big killer blade), ripsaw (even bigger killer blade) and planner (whirly blade that could make a mess of your hands). The very well stocked workshop is of course why people come back term after term. For just over a hundred quid you get access to loads of machinery and can get on with your own projects. While I was there we had a demo of biscuiting and the use of the veneer press. These are new to me - LNW socket lamp irons. I'm not sure why this railway company decided to be different from everyone else in the way they attached their lamps to locomotives, but as a modeller I wish that everyone else had done the same thing. 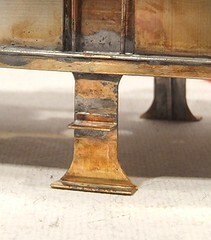 The sockets are supplied as very neat lost wax castings. All I had to do was snip them off from the fret and clean the backs with a file. Then, after tinning with conventional solder, I used the RSU to fit them to the loco. That's a nice quick process and a whole lot less painful than bending bits of etch to make a conventional lamp iron. The results are a whole lot less vulnerable to handling too ! Yet another moment when I wonder about the sanity of the designer of this steam engine. The front steps dangle from an impossibly slender strip. Even in 7mm scale this is less than 2mm wide. The parts are nicely etched of course. I decided against popping a rivet in the upright as I doubted this can be done without mangling the metal, or at least I don't believe I could do it. What I can do is beef this part up so the model can be handled without fear of damage. In the rear of each step the widest bit of wire I could hide has been soldered on. This worked better than expected and has really strengthened the part. At the back the steps are much more conventional. Despite this I was so pleased with the hidden wire I did it again here. It's not unknown for these to deform although as there isn't a slot to locate the centre step, this traditional weak spot isn't present. By the time I got to attaching these parts, the mass of metal in the model had grown so large that the best way of fixing parts is with a gas torch rather than traditional iron. In with the heat, melt the solder, fix the part and then back out again letting things cool down. No burnt fingers this way ! A couple of weeks ago I expressed some reservations on the design of the Coal Tank locomotive's back end. The bogie seemed to offer far too much movement for the axle which flopped back and forth rather more than it should have done, not to the detriment of the track holding though. Apparently this was all down to a packing error and I should have received an extra set of axle bearings. With these now fitted the wheels stay where they are supposed to. 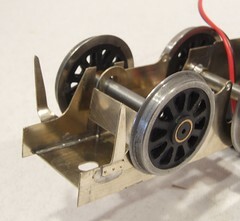 The bogie, while pretending to be a radial truck, will still move from side to side and up and down so I still expect the wheels to stay in contact with the track. The keen eyed will notice that I fitted the "top hats" pointing out rather than it - this should allow me to limit the side play by filing them down as required. I want to stop the flanges touching the frames if possible. We don't want to wear the paint or cause any possible short circuits. At the front some fake frames are attached to the body. This is because there is a hole in front of the smokebox which is wider than the working frames. These stop behind the cylinder fronts, the curvy bit sticking down in the photo. Perhaps if I was building in S7 this wouldn't be a problem but then the kits not designed for that (Note: The Coal Tank kit now comes with a different chassis than the one I'm building so things may all be different). I wasn't happy with the shape of these so re-made them from some scrap etch. My version also fits rather better to my mind too. It looks just as good too. At least the body now sits down properly. And yes there are guard irons to go on but if I do them now I'll spend the next few days sticking them in my fingers or beding them every time I put the body down on the bench. Isn't it a masterpiece ? 24 hours ago this was a square stick but yesterday, through the skill of my hand I turned it from oblong lump of wood into a truly useful item. Since you ask, a shopping bag holder. Put the plastic handles over the thin bits and carry them by grasping the comfy centre section. OK, so I can't entirely take credit for this work. Woodex is on again this weekend and I dropped in out of curiosity. In the past it's been an entertaining show and a useful source of cheap veneers and tools for my other model making activities. Being only a 5 minute drive away helps of course, as does an entry fee only slightly more expensive than a pint of beer. 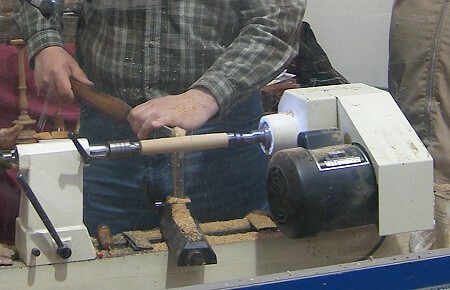 Wood turning is something that looks very relaxing and pleasant to do. Like snooker it also looks pretty easy but once you have a go I suspect that this will prove to be far from the truth. Anyway Guy Ravine, a professional wood turner and teacher, offered free half hour sessions on the lathe so I booked up for one. When I got onto the stand for my go a square stick was chucked up in the lathe and Guy proceeded to show me the basics of turning (pun intended) this into a round stick. Most of the session was hands on with a quick demo of each tool followed by plenty of time to have a go with it. First we made a round bit of wood, I'd always though this would be hard work with the tool bouncing off each corner but it wasn't, then the thin parts were formed with a couple of pointed tools. Rounding the ends came next and was by far the hardest job. You have to "roll" the tool along the support and I found it difficult to get this consistent, hence my un-symmetrical work. Then the centre section took shape and we finished off with 5 different grades of sandpaper and some finishing oil. Result, a nice smooth object that I can be proud off and hands that were slightly slippery but a bit more recovered from the grittiness left over from building work. In all the work took about 40 minutes but as there were a surprisingly low number of people wanting to have a go this wasn't a problem. Guy was an excellent teacher and I felt completely confident, but not entirely competent, in using some huge wood carving tools on a tiny bit of dead tree. This session was worth far more than the cost of entry alone ! Having had a go I can understand why people enjoy turning. Watching the wood and shape as you work with it is immensely satisfying. I suppose it's like being a reverse potter and probably gives the same sense of enjoyment. However people do use their hobby to make odd things. One demo showed how to make wooden hats, handy for those times when you need discrete protection from falling objects I suppose. Interesting demo though with some fascinating techniques. At one point a light is put inside the hat so the outside can be turned to the right thickness. The light seen throught the wood give an indication of the depth left. 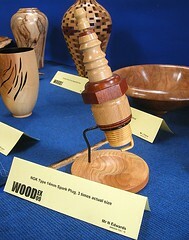 Another exhibit was a wooden model of a spark plug. Not any old spark plug either - an NGK type 14mm plug don't you know ! Still, it was all good fun. 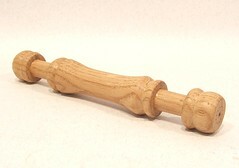 I still don't own a proper wood lathe but I could be tempted. It is a messy hobby though. Sawdust and wood chippings everywhere ! 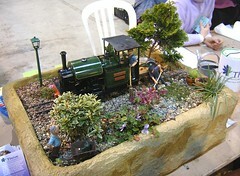 Can a garden railway ever be said to be pointless ? Well ours could as the turnout total was nil. We needed switches or it would be more of a garden train set with entertainment value to match. LGB (bless 'em) only produce the large radius points with electric changing and at an an eye watering price. At the Larger Scale show though, I spotted some track that looked a lot like LGB but wasn't. It's from "Train Line 45" and is compatible but significantly cheaper. 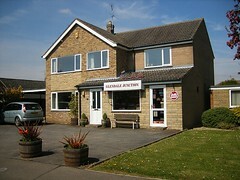 The importers are Glendale Junction situated in Deeping St James, just north of Peterborough. In my case, this involved a couple of hours lead by a slightly odd Garman SatNav. On the plus side I did see the fantastic Harringworth viaduct which 3/4 of a mile long and soars out of the countryside. The road may have been windy and the satnav annoying (how can it forget to speak or even say left when it means straight ?) but this alone made the journey worthwhile. Actually satnav is a good thing for finding Glendale Junction. The shop is based in a house tucked in a side street. If you are looking for it, print a map off fists as despite being located just off the town centre, it's easy to miss. Once you've found it though, for a garden railway modeller this is an excellent shop. The showroom isn't huge, think domestic living room rather than Tesco, but it is actually packed with stock. The walls are lined with LGB on on side and kits and stuff on the other. The first things to catch my eye were the IP Engineering wooden kits. Obviously I preferred the little coaches and wagons while my Dad started drooling over the beautiful laser cut wood for coach paneling and handrails. Those destined for the Ffestiniog coaches are particularly impressive and I suspect may be appearing on our little layout one day. 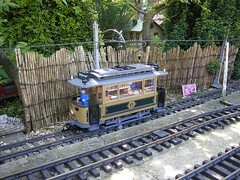 In the garden, which is accessed via the small second hand selection and a workshop, you find a railway. And lots of Tuxcraft concrete mouldings. Handy that as we needed an extra tunnel mouth. The railway is a fairly typical garden line - raised up with LGB trains running automatically and plenty of Pola and LGB kit buildings. It's certainly a good indication of what you can do even if these lines tend to be as original as their owners. The garden isn't large either which offers encouragement to those with less than an estate to work with. In fact by using the tighter track formations an awful lot of railway is contained in a reasonably small space. We left with a couple of points (which I'll write up later), the Glendale motorising kit for an Ochre wooden tram, some people and a few other bits. All useful and just what we'd come for. One surprise was just how busy the shop was. Several customers called in during the half hour of our visit and the 'phone didn't stop ringing. The proprietors said that so far business is crazy - in a good way. 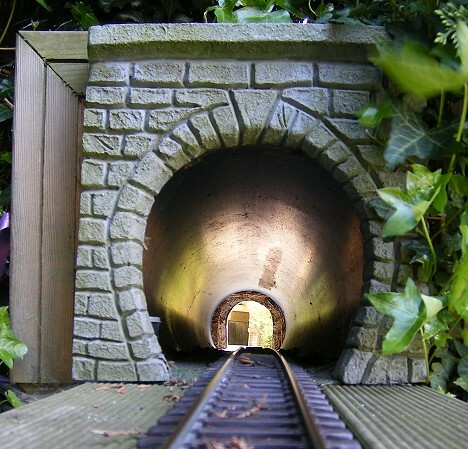 It seems that people are filling their gardens with railway and shouting "Tax this Alistair" or "You won't get your hands on this Fred" I think. I don't blame them either. If you get to visit nice friendly shops like this, that can only be a bonus. Some days you really want that lovely Slaters Plasticard. Sadly they don't make it in 1:1 scale so for the garden railway I've had to use real bricks. For the last few days I have spent my mornings building a wall to enclose the raised flowerbed that will contain the line in the garden. 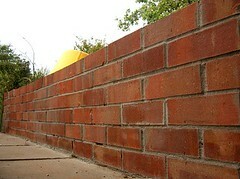 First there is a wall made from concrete blocks and then to make it look pretty, a brick wall. The double wall is then topped with flag stones and should end up at just the right height to sit on when drinking tea outside. Planning, as they say, is everything. To be fair the tea drinking part has been tested, purely in the interests of science obviously, and works well. 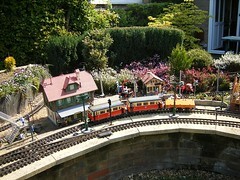 This isn't a serious garden railway, it will be a simple circuit to exercise our G gauge engines a little. 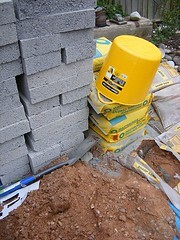 Brick laying isn't actually too difficult. If you get the mortar to the right consistency and check everything as you go along the results, even with someone as untrained as me, can be quite acceptable. The downside of not getting a professional in is that the whole job takes a lot longer - I bet a proper brickie would have built this wall in a day whereas I took 2 just for the brick bit. Practise certainly speeded up my work, I went from checking every brick with the spirit level to doing 3 at a time, accuarcy improved too. With the benefit of a days break from mortar mixing, the results aren't too bad and there is a real sense of satisfaction in looking at my work. I'm not going to knock up a real building a for a while and I certainly appreciate the skill employed when I see a brickie in action a little more. Time to pretty up this steam engine with some beading. According to the instructions in the kit this is carried out with bits of brass etch including bits of scrap from the leftover metals. Nuts to that, I prefer to use a trick passed on to me by John Sutton, editor of the 3mm Scale Society magazine. Simply take some normal fuse wire, 30 Amp in this case or the fatest one of the card, clamp one end in a vice and pull the other. This straightens the wire. The solder it to the top edges of the tanks and other parts to be decorated. Fuse wire is tinned copper so it solders easily with a bit of flux. To finish off, polish with a fibre stick and a lovely job is the result. I go a bit further and bead the whole length of the tank tops in one go, bridging the cab door in the process. This ensures a nice straight line and I can open the door up later with some wire cutters. I've decided to start painting the loco and in a revolutionary move will be colouring it in with marker pen. Far easier than messing around with paint I think. Only kidding. The marker pen currently spoiling the lovely brassiness of the coal tank locomotive boiler is my version of engineers blue. Blue is a liquid painted on to metal before marking out so that the scribed lines show nice and clearly - on untouched metal you have to get the light right by looking at odd angles to see your line. Either that or scribe it so deeply that you can still see it after painting, neither of which can be called A Good Thing. Trouble is it's horrible stuff. It stains your fingers and seems a very messy way of working in an age of computers and pop tarts. I prefer to use a permanent marker pen which is easier to apply and works just as well. 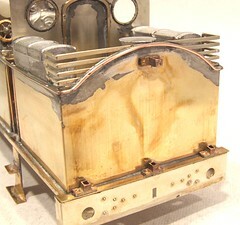 Don't worry about the cleaning off either - Shiny Sinks removes it when cleaning up after a soldering session. The marking out is for handrail holes. The boiler doesn't come pre drilled so I have to do this the hard way. 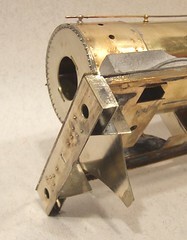 First a line is established parallel with the footplate using an oddleg or Jenny caliper. The dividers are set to provide the spacing and scribe the vertical lines. Finally the centre is each cross has a scriber pushed into it to give a dimple that guides the drill bit. At last, some whitemetal bits. Ok so the bits are major component rather than detailing parts but it's a nice change from all that brass. The splashers are nice clean castings that just need a touch of trueing up at the front. I suppose the designer could have made them up as etched parts but suspect that the sheets were already full so castings were the way to go. The spring poking out from the back is a clever part - what you see is what you get. The rest of the spring simply doesn't exist. Likewise the reversing lever stops just out of sight behind the tank. Some might feel cheated by this but for a model intended for use is it clever to spend time making parts that are never seen ? What a lovely day for a sail ! The morning started a bit grey and surprisingly chilly but as the club had organised a "Footie" yacht sailing day with members of Wickstead Park Model Boat Club, it seemed worth a trip to the lake. I charged up the batteries for Pigeon Pie and my Slingshot and headed to the water. By the lake the weather hadn't improved but at least there was plenty of convivial company. 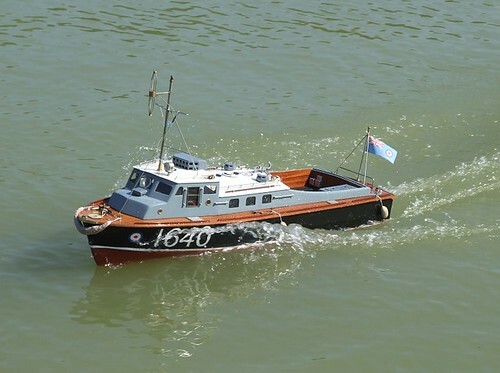 The Wickstead guys started to arrive with some very impressive boats - it seems that they all built large, well detailed tugboats. When I say large, I mean around 4 feet in length. Most arrived on trolleys and needed to be launched in two parts, hull first then superstructure plonked on top. Sound units were also de regur and very effective. In a larger model boat you can generate the kind of base that always seems to be lacking in model railway engines in comparison. My day wasn't perfect of course, the Slingshot battery was plugged in and... nothing. So I tried another battery with the same result. And another. And another. Rather than try and fix things on the bank I stuffed the boat back in its box and sailed Pigeon Pie instead. This gave me time to think and with that boat back on dry land I had another poke around. Squeezing up the connections in the battery plug I managed to get some life and so gave the boat a few circuits of the water. I needed some practise as we've got some new buoys which look like the balloon from "The Prisoner" painted orange. Nice but a bit larger than the old ones. Bouncier too as several members discovered when they tried to park boats in them. Half a dozen circuits later the boat died. Not entirely unexpected as I knew the battery hadn't taken the greatest charge, saving the good batteries for racing seemed like a good strategy. Back on dry land the model wasn't to be revived though so I'm going to have to look further at this. 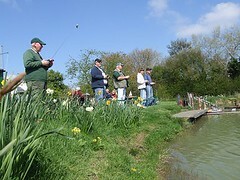 After last years efforts I want to have a reliable boat, not something that needs constant fiddling. Anyway a bacon buttie and some more sailing fun made me feel better. The sun came out and by the end of the day a "couple of hours at the lake" had become over 5 hours. We'd seen some fantastic powered models and very mediocre yacht racing thanks to a lack of breeze. I am now convinced that boats should have engines for propulsion and not bedding on sticks ! With a blisteringly successful 16mm Society AGM only a few weeks ago and trade stand price increases I wondered just how good the Larger Scale show would be this year. Of course it covers a wider range of scales, from 7mm upwards but that still isn't a whole lot of people compared with a mainstream event. Add to this at the AGM there had been plenty of G scale for sale so most of the main potential customers would surely have had thier fill and be back out in the garden laying track by now and you'd wonder just how many would cross the threshold into the hall. 8 quid to go in, and the good news was that the first model I saw was a Garratt. 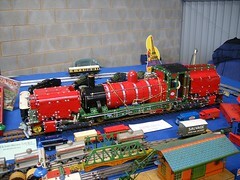 A great big Garratt made of Meccano. It was a very impressive model of one of the steam locomotives now running on the Welsh Highland Railway. Chatting to the builder, it took him around 3 months to create the loco and if he hadn't been around the stand all day I'd have been tempted to grab and make a run for it (joking !). While there were several scale models of the same loco at the show, this was the one that really made an impression on me. It's almost as if the slight cartooning made things look even better. Whatever, that was something the builder had every right to feel proud of. As it turned out, working layouts were the highlight of the show. Compared to previous years the trade was on the the thin side and if you'd turned up with a shopping list I suspect you'd have been disappointed. It's always a bad sign when one of the stand is selling sweets - at least it wasn't the infamous sickly sweet fudge this time but still not what you want at a show full of meths powered steam machines. I suppose someone will suggest it allowed the modeller to buy something for the wife if he'd overspent but I'm not sure if some chocolates, no matter how posh, would make up for an inadvertent purchase from Roundhouse ! Fortunately I find watching live steam layouts, even when they are little more than test tracks, more fun than finescale ones a lot of the time. Not sure why really, perhaps I am succumbing to the attitude that seeing something move is more important than how well that something is modelled. O gauges, Gauge 1, several 16mm narrow gauge and a couple of G scale layouts were on show. All were run by middle age men who looked after their models like they were children and at the same time seemed to be having great fun. There were lots of smiling happy faces. OK, so the air was thick with meths but I'm sure it wasn't just the chemicals that made them happy. The G1 model was the usual test track style and featured a very customer friendly board telling visitors what would be running at different times each day. Every loco operated for half an hour and with two tracks that mean the trains change every 15 minutes. In the sheds members prepared their models and chatted both to the public and themselves. I was mightily impressed with a model of "Morning Star" that was fired by real coal. I think this probably amounts to the pinnacle of steam power in engineering terms - you get to look down on those who use meths or butane to fire up ! At the end of the day I'm glad I didn't have to travel too far. If I had, my feelings toward the organisers wouldn't be that charitable I suspect. As it was I picked up some bits, enjoyed seeing some small scale steam engines running and had a good lunch. 8 quid is a bit steep for admission in my opinion but I suppose the show has to make a profit as it's run as a business. Perhaps next year they might consider moving it a little from the Stoneleigh event and perhaps doing a few deals for the trade to fill things up a bit. It was noticeable that the aisles were wider than normal and you could have fitted in a few more stands. There was inspiration on offer and you can't put a price on this of course. Enjoy more photos from the event. Having bolted the boiler into the coal tank locomotive I proceeded to tack solder the new lump of brass to the side tanks. Since it was late I planned to stop work once the tacks had cooled and take another look in the morning. Sometimes what looks good in the evening can appear wonky the next day. I like to think this is due to the metal cooling overnight and not my own stupidity, but whatever the cause, I've been caught out like this before and learned my lesson. However as soon as I looked at the model from the front it was obvious that the side tanks were both leaning in at the top. Handy for aerodynamics if this were a VTOL steam engine but a bit rubbish for the model I'm building. 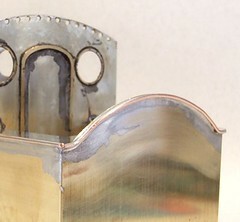 The problem stems from the tack solder joins pulling the tanks and boiler together. Of course there should be a gap between them. I couldn't leave it like this and had to fix the problem imediatly. Heating up the solder blobs took more effort that expected and it quickly became obvious that even with a gas torch I wasn't going to get both sides separate at the same time. Plan B therefore involved heating the join and stuffing a spacer in to force the gap. Now I'm not posh. When I occasionally eat chips after the odd beer I use my fingers. It's not that I'm too drunk to accuratly stab a chip with a fork, it's just that chips in paper are perfectly natural and shouldn't involve cutlery, even of the temporary wooden sort. Despite this my local takeaway insists on proving me with a chip fork. Sensible people would throw these away but I stick them in the same drawer that contains half a forest worth of wooden coffee stirrers. I find all sorts of wooden utensils useful for holding hot metal while soldering so it's not such a daft idea. Anyway, a pair of chip forks slightly sharpened worked a treat for putting the boiler-tank space in. The forked ends span the tabs in the inside tank sides that support the boiler. There's probably a proper engineers way to do this but this is cheaper and you get chips too ! Look at those lovely rivets ! The photo doesn't show clearly the beautiful curves around the perimeter of the smokebox or ends of the cylinders but be assured, they are there. It's one of the design details that make a pre-grouping steam locomotive - an air of elegance that somehow went missing in later years. As usual the lumps are courtesy of the GW Models press and followed the half-etch dimples in the back of the part. One impressed the front and back of the box were joined with stretchers. Interestingly these are brass as opposed to the nickel faces. I assume this is to make best use of the metal in the etching process. Locating bits is a touch harder when they are spread across two different sheets, but not enough to worry about. The boiler arrived pre-rolled. I just had to solder the seam at the bottom and then fit the formers at front and back. 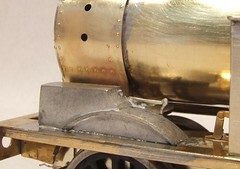 These incorporate holes to allow the boiler to be bolted to the smokebox and cab front. Normally I ignore these and go straight in with the soldering iron but this time I've used them so I can ensure nice alignment of this major part. Mind you, trying to do up the front bolt was "entertaining" as none of my screwdrivers fitted properly into the space under the loco, something always seemed to be in the way. Hindsight tells me that a nut spinner would have been better to start things off than a pair of pliers but at the time it didn't occur to me. With a nice flat footplate, the main sections of bodywork for the Coal Tank locomotive fit in place fairly easily. The only thing making the job a touch harder is that the footplate slots aren't very deep where I blanked them off with my valance work. Tab and slot construction is wonderful in etched kits. Essentially the manufacturer has done all the hard work of lining bits up for you. Simply fold the parts, push the tabs through the slots and solder. Easy. Sadly, etching isn't as precise an art as you might expect and sometimes the slots are too big or too small. To be honest I prefer the former. Checking the alignment of parts is fairly easy, opening a slot up in a bit of metal isn't. Invariably too thin to get a file in I usually end up shoving a scalpel blade in - fine if there problem is due to the cusp left after etching but a recipe for distortion otherwise. In face if this is the case I'll often sacrifice the the tab and do things the old fashioned way. 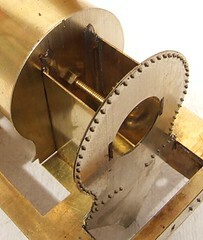 As it was the alignment allowed a little lea-way but the basic, boxy shape of this particular steam engine means that a rule along the side or square on the corners keep things tidy. The only confusing area was inside the coal space. This includes a sloping part and two sides with slopes but not the same slope. A bit of tack soldering and dry-fitting quickly showed me what I needed to do but there was a touch of head-scratching to get there. Once cleaned up I couldn't resist bringing body and chassis together for a quick look at progress. Yes it looks like a steam engine and yes one of the brake hanger wires gets in the way so the body doesn't sit down quite right yet. Some things look stand out like a sore thumb on a model if you don't get them just right. One of them is a wobbly valance or footplate. To get the model footplate flat in this kit, a pair of valances are supplied. These are to be folded into an L shape and soldered in place. Now maybe it's me but the result of putting in the fold was a very wobbly L shaped piece of metal. Perhaps I should have deepened the half etched line with a scrawker, Perhaps bending bars rather than a "hold n fold" would have been better. Whatever the reason, I needed to deviate from the kit or end up with something that looked terrible. Unfortunately, the L section holes in the rack were empty of the sizes I needed so in desperation I bought box section instead. This was dressed on one side with a big file to make the face nice and flat, then soldered in place. Result, a nice flat and strong footplate. Now if this were my locomotive I'd stop here. However valances are not boxes but vertical metal. I had to remove half the box section using a mini drill fitted with a cutting disk. A bit of grinding followed and the result is presentable. You'll have to turn the locomotive upside down and have a good peer to spot what I've done. If you do this either you are the owner or he's about to remonstrate with you for fiddling around with his model. "Unless we have an interest and unless you have work - play work or money work - an activity that means something to us, it's hard in our society to feel relevant or useful," says Mr Hodson. It helps if the pastime we choose is "something that absolutely takes you out of yourself. "If you only dwell in your own head you're going to be miserable." Our hobbies should, ideally, be something we can take with us through life and connects us to our earlier selves. "I stopped playing squash when I was 40," cautions Mr Hodson. "The idea of picking up a squash racquet now is fanciful," he admits. I think this means that model makers should all be stress-free and happy. This in turn will lead to a long life, perhaps long enough to build all the kits we accumulate in cupboards ! Regular readers of this blog know I've got a couple of layout ideas bouncing around in my head - something Manx and another in On30. What has stopped progress is planning the baseboards. The traditional 2X1 wood with a chipboard top hasn't been our style for over 20 years and each layout has been put together in slightly different ways. The new layouts will be similar in look to the Hellingly Hospital Railway. That is they will be a 3D picture with the scene tightly framed by a fascia board. That layout arrives as a scenic section with fiddle yards bolted on the ends. This format was forced on me by the overhead wiring which couldn't easily be joined to allow a longer scene. Trouble is, this limited the length to 3 feet as it had to fit across the back of a Peugeot 306. Neither new project suffers from the problems of tramway wiring but we have liked the idea of carrying in the model as a lump which is quickly erected and dismantled. Whilst setting up at a model railway exhibition is often a leisurely affair, getting out is something to be done as quickly as possible. No exhibition manager wants to be standing around watching a display fiddling around packing up when everyone else has gone home and quite frankly I want to be on my way to a Little Chef as soon as possible after the death. So, what we need is an all in one display. The limiting factor this time is a Citroen Berlingo*. While this is a fabulous car, the back is limited to about 3 1/2 feet in length as the rear seats don't fold completely out of the way or come out. But we want a scenic display a bit longer than this. That means either several boards of getting clever. Well clever is what I think I have done. If I fold the baseboard then we can get 6ft in the back of the car. Folding it complete with fascia is the tough bit if you want something structurally sound. For a while I've had the idea bouncing around in my head - yesterday I finally got around to drawing it up. Basically there is a front board which flaps up over the scenic area and bolts to the fascia. This makes the boards structurally sound enough to fold using (this is the clever bit) hinges from past table. Then and end board completes the box. Using captive nuts everywhere I expect this packing up to take about 10 minutes tops. Obviously there are a few details to finalise - some sort of locating pin to hold the top board to the bottom seems like a good idea. I haven't considered legs either yet but hey need to be tall so trestles are out. The basic idea is there though - click on the picture for a bigger look and let me know what you think. *Yes I know I have a VW Camper which would take a 6ft board. It only returns 20mpg so I prefer to use the 50mpg+ Berlingo if at all possible. The camper is also quite a bit slower and more prone to breakdown. More importantly the mileage limit on classic insurance is 5000 and I'm not about to waste any of that thundering up and down motorways if I can help it. No books and No kits. There was a plan. We would go up to York and enjoy the show, talk to some trade stands about taking space at the L&WMRS show 2010, but we didn't need any more modelling materials or literature. None at all. Definitely not. First stop on arrival was the restaurant where on the "When in Rome" basis we munched on roast beef and Yorkshire pudding. 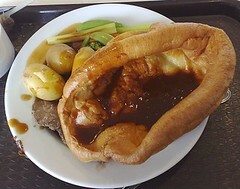 Very nice it was too with especially huge puds and excellent meat & veg. I know you probably don't care about my lunch but I mention it in case you are reading this in 2010 and wondering if there is food at the show. This is public service blogging. As usual the show fills the three floors and two mezzanines of the racecourse - 113 stands in all. 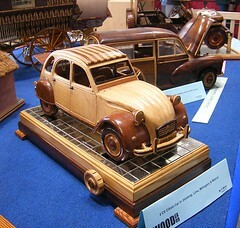 York's a modellers show - there is ready to run for sale but not huge amounts of it. 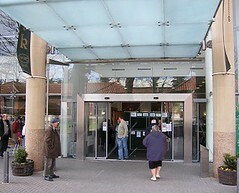 Instead this is a good place to find specialist traders and people selling those hard to find bits and pieces. For me this is more important in many ways than the layouts. My shopping list was short - a new bit for my hard worked soldering iron from Squires - but that hasn't ever stopped me in the past from leaving with a light wallet and heavy bag. For layouts, this was a particularly good year. In N, I really liked Bassenthwaite Lake - a small layout mostly given over to a decent sized bit of water. To forestall the regular questions, instructions are attached to the front explaining how this is done. Something to do with artex and varnish apparently. Moving up scale, East Lodge is nice - a rural backwater in great Eastern territory. Good Class 15 diesel haulage in evidence - give me a weirdo loco and I'm happy - and nice atmosphere. 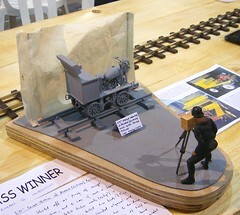 The construction was interesting too with flexible MDF used for the backscene. This allows curves to be formed in the corners, something I've aspired to but never managed to build. I could go on and on but you'd be better off looking at the photos I took and making your own mind up. I have ignored some of the better known layout as these have appeared on the blog before and concentrated on details that appealed to me. Chatting to Tony Hill in the demonstrations area, he mentioned that he has filmed some scenery construction pieces for a new on-line magazine: http://www.modelrailway.tv/ which sounds interesting. It's not launched yet but you can sign up for a newsletter with more details. The idea is interesting so we'll see how it develops. Still in the demos area I learned a bit more about lettering private owner wagons. As with lining locomotives it seems that the skill is not so much in the initial application of the paint, but in the touching and tidying up that goes on afterwards. The results spoke for themselves and I when I get around to doing some new wagons for the Hospital Railway I hope I can put the advice to good use. 5 hours after we arrived it was chucking out time. A thoroughly enjoyable show that was worth the looooong drive to visit. I stuck to the "no new kits" mantra although if the demo from NG trains had had some of the amazing laser cut kits for Argentinian coaches from Maiten Shops in stock this might have changed ! The bag did seem surprisingly full of books though including Futers new Scottish modelling one, something on micro layouts, Oban and Calender for the photos of Ballahulish and several magazines from various stalls. This morning , slightly hung over, I though "Sod it, we'll go to York anyway". 280 miles later, I'm too tired to make a proper blog post. It was worth it though. 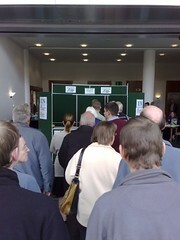 Easter usually means York Model Railway Show. Sadly for various reasons this year, for me, it doesn't. I can't remember the last time I wasn't there as either a visitor or better still, exhibitor. It's the feelings associated with the later I missed this morning. For some reason York feels different to any other show I've taken part in. Perhaps this is because the day usually starts with an excellent breakfast followed by a short stroll from the hotel to the racecourse venue through a city I love. Or maybe it's just the tang of anticipation before three days of (hopefully) business. Even when the weather if iffy, the day always seems to dawn bright. There is much more of a community feeling amongst those behind the barriers than you normally find. We have probably chatted to each other over the breakfast table. There is a good chance we'll visit the same pubs in the evening. We know we are going to be sharing a show for three days. Many of us have known each other for years and took the opportunity to renew friendships on the Friday afternoon setting up session. Of course York is a wonderful city. In springtime the daffodils are out on the walls, tourists are wandering the streets and you are part of something, not just a visitor. Maybe this is it - for most shows you turn up, spend two days in a shed on the outskirts of town and see very little of the place you are staying. Three days allows for a bit of exploring - in the good old days we used to have four and the show was in the centre of the city so the delights of buskers and excellent bakers were mere minutes away. The show is excellent too. Big enough to entertain for the whole weekend and with trade capable to emptying your wallet if you aren't careful. After all, it's a shame to go away an not come back with a souvenir isn't it ? At the back of the coal tank there should be a radial truck - one of the more complicate wheel carrying devices found on your average steam engine (read how to build them in larger scales). All model railway kit manufacturers cheat and turn the truck into a bogie - it looks the same and works in a pretty similar way but is a whole lot easier to build. This one seems, unless I've misunderstood the instructions, to have rather more play around the axles than I would like to see. 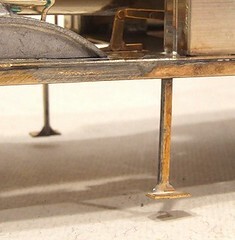 In fact all the metalwork seems to do is hold the wheels in roughly the right position. I don't understand it but decided that I might be wrong so the best bet would be a test of the chassis. The guys in our club O gauge team generously allowed me to make use of their layout "Kimble". I've not hooked up any pickups so a 9V battery provided the juice to run the motor. As you can see, the chassis runs. Nicely. Over points and stuff. All the wheels stay on the track and if I can gather electricity efficiently from the track all should be OK. The thing is, those rear wheels don't really behave as I would like. Too much forward and aft movement for my liking. I think I'm going to bush the axle anyway. This ought not to affect the track holding detrimentally but will just make things look better. Before I could get to put the wheels in this chassis there was a little preparation required. Slaters wheels are excellent but as I've described before, you need to do a little work to put the crank pins in. 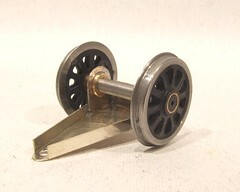 The wheels have the correct flat face rather than traditional slender spoke of most steam locomotive wheels. If I have a complaint it's that the square bushes in the wheels grip the axle a little too tightly making it difficult to remove them from the axle. The trick (engineers close your eyes now) is to half undo the grub screw and tap it on the end with a hammer. This punches the wheel off the axle end. It's probably not too kind to the threads but you only need a gentle tap, not a full bodied wallop. The con rods are a lamination of three layers of etch, the top being half-etched for detail. A touch of opening out of the holes allowed them to slip over the crank pin bushes with the tiniest bit of slop - if I need more I can introduce it but the less the better at this stage. As it is, no extra easing will be necessary. With the motor connected to power everything runs well first time. The chassis runs back and forth on the workbench . At the back I have assembled the pony/radial truck. The jury is still out on this bit as it all seems a bit odd to me and not nearly as solid as I would expect. I'll try the chassis out on a layout and might make some changes in this area. After all, the designer probably knew what he was doing and so just because it looks odd to me is no reason to make changes until I'm sure I'm right. After all, the mini looked odd to people when it first came out but still seemed to work OK. Apparently there are two versions of the coal tank locomotive chassis kit. In this case the older version has been specified - the newer one has some changes and slightly more detail. Quite where that detail might be I will have to investigate at some point. What we have looks pretty good to me ! With the etched parts in nickel silver, construction is completely conventional - a pair of sides separated with fold up spacers. The bearing holes needed opening out a touch as expected. Inside the frames are half-etched marks to help locate the firebox/ashpan sides. Everything appears to be accurate enough. The bearings are all level and match the holes in the coupling rods well enough. I'll find out better once the wheels are in. There is still a rear pony to construct of course and I've had fun with kit manufacturers attempts to fake a radial truck in the past so we'll see how that goes. 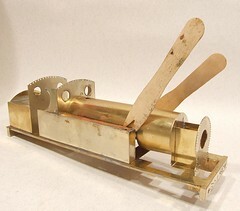 The only non-nickel part here is the footplate support which is from the brass sheet. 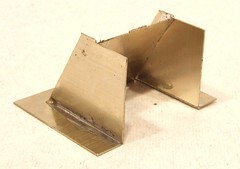 Each support is formed of two parts - a triangular bracket and riveted plate this emerges from on the chassis. Perhaps a slightly longer tab on the bracket would have been nice but it's nothing to worry about. One error the eagle eyed will spot is that I've attached the front guard irons. At the time I wondered why they didn't have nice etched locations like the rears do - that's because they actually fit to part of the frames fitted tot he body. Perhaps if I read the instructions properly then I'd have spotted this and saved a few minutes desoldering and cleaning up. Mind you, all those instructions, they are only in there as a last resort aren't they ?! I'm not sure why I decided to start construction of the coal tank locomotive. Perhaps it was because the parts were in a bag by themselves. Maybe it just seemed like a nice quick standalone project. I think though it was a combination of these plus the smell of quality. Unpacking the parts I wasn't disappointed. The gears are lovely. 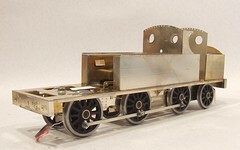 Nice and chunky - well able to handle the sort of torque required of an O gauge model loco. 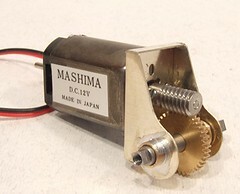 The motor, a Mashima 1833, is as as big at the tank on the last engine ! The gear cradle etch folder up easily and only took a little reaming out of the bearing holes and some solder to prepare. The resulting gear mesh is excellent - easy to adjust too as the motor retaining screws are a doddle to get at being either side of the shaft. I wonder why most 4mm cradles aren't as good as this. Normally I have to drill the mounting screws out and fiddle around to get things working. Not a difficult job but more than I needed to do here. Reviews tend to mention fairly early on the size of a the box a new kit arrives in. Usually the idea that the finished model will fit in the box it arrived in is seen as a tremendous plus point as well as allowing the author to pad out the text in the hope of a slightly higer fee ! Well in this case I am certain even before I break out the soldering iron, this loco will not fit in the box once I've built it. The base of the box is filled with etched parts wrapped in tissue paper and they very nearly fill it. In fact if it were tall enough to take the finished model, that locomotive would rattle around something rotten as it would have far too much latitude. 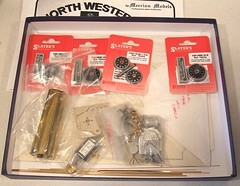 The kit arrives as two etched in brass and nickel silver, a pre-rolled boiler, lengths of wire, sheets of instructions and a couple of bags full of whitmetal fittings. On top of this are Slaters wheels and a motor/gearbox combination. So far it all looks pretty good. This is my first 7mm scale kit for a while and so I'm looking forward to working in a chunkier scale for a change. The biggest challenge, assuming there are no "surprises" during the construction, will be painting. This model is to be outshopped in LNW lined passenger livery. The black paint won't be an issue but producing nice neat lining out could be. I've read up on the subject and have a pretty clear idea how I will do this, but there proof of any pudding is in the eating and I may have to have several helpings to get it perfect ! When painting a large number of figures the toughest part of the job is avoiding the temptation to use the same colours on too many little people. The painter spends as much time opening tins and cleaning brushes as he or she does applying colour so the little lazy voice in the back of the head says, "Go on, give a couple more of them grey trousers." This must be resisted though, or you end up with a crowd in uniform rather than in realistically varied outfits. 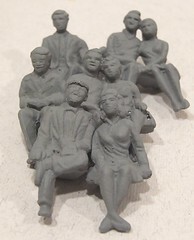 As the paint goes on, some of the figures start to develop personalities. The man on the far right of the group is what I think would have been described as a "beatnik" with his pale coloured turn-ups and wild red bow tie. He's probably a teacher in higher education and likes to think of himself as a staunch left winger. Or perhaps he is just a lump of lead alloy and I should stop being daft. On a more practical note, since these will appear on a trade stand I've tried to use as many bright colours as possible. A mass of gray and brown won't catch the eye at a busy exhibition. Of course if this works then there is a chance people will buy lots little people for their coaching stock. If this happens I want to be there the first time an engine is coupled up to a train of twelve full of whitemetal figures, it will be quite a show ! With the garden railway project in full swing and always looking for an excuse not to lay any more blocks for a day or two, it's off to Stoneleigh for the 16mm Society AGM and exhibition. Last years even was fantastic so hope were high for 2009. We weren't disappointed either. In fact if there was any cause for complaint it was that there were so many visitors, getting to the stands was difficult first thing in the morning. All this at 8 quid a head too ! If there is a "credit crunch" as the media are obsessed with telling us, then it seems that modellers have decided that investing in live steam engines and suitable rolling stock is a better option than leaving money in banks. I suppose a Branbright engine will hold its value somewhat better than stock and shares. Besides, a firm of model engineers is more reliable than anyone in high finance ! This year I didn't take that many photos, instead you can enjoy some wobbly compactcam film of steam engines running past on some of the layouts. 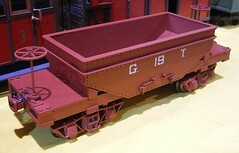 I even found inspiration in the form of a hopper wagon on the Triassic Model Works stand. While no use to me in the garden, they would be ideal for the On30 railway. Apparently the prototype ran on the Gilpin Tramway in the USA, a gold mining railway that only existed for a few years. The plan comes from a book on the line which is long out of print (there is a current edition but this doesn't have plans) and wasn't to be found on any of the book sellers stands in the hall. If anyone has a copy for sale, let me know please. Aside from this wagon, I think my favorite model was of a photographer tanking the official picture of an oddball motorised permanent way vehicle. The scene has the sheet traditionally held up behind the subject to block the background out and an information panel in front. It's a beautifully presented model. Over four hours after going in we came out with a concrete tunnel mouth (they only had one) and loads of books and magazines. Not rolling stock or locomotives this time although I do have the hardware for a Manx Railway M wagon so another project for the pile ! "I've bought some moulds for Gauge 1 figures", said Trevor, "Could you paint a set of them for me ?" No problems, I like painting figures. It makes a nice change from wielding the soldering iron. No spray paint either. Just a few pleasant sessions at the workbench with small brushed and odd pots of paint. The figures aren't the most detailed in the world but the mouldings were clean and apart from a touch of scraping along the mould lines, preparation was limited to giving them a quick scrub to get any grease off. Then a coat of primer so I can see what I'm up to and to help the paint key to the surface - these will be on a stand and are likely to be handled more than those on the average layout. Halfords car body primer is sufficient for this. Just a quick spray too as we don't want to cover up the details do we ? The first proper paint on is Humbrol flesh tone which is dry brushed with the Revell equivalent. Then back to the paint drawer to try and pick out some clothing colours. 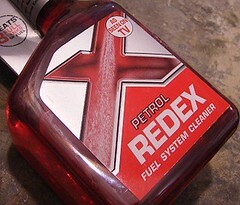 Owning old vehicles I've always been a big fan of Redex petrol additive. It really does make an engine run smoother and keep all the important pipeage clean. I don't do that many miles but every so often I like to treat my VW campervan to a slug (sorry, carefully measured dose) of treatment. So it was I dosed the fuel on Wednesday morning. 20 minutes later I hopped in to head off the the boat club. The engine fired and then died. Further attempts had it turning over but not firing at all. B&**$r I thought and went around the back to have a poke at the engine. The fuel filter looked dark so I changed it over, something I got really good at when suffering a rusty fuel tank a few years ago. This didn't help but I noticed that the petrol appeared purple and not the traditional clear. I didn't think muck of this at the time putting it down to a trick of the light or dirt in the filter. Since changing the filter had splashed a small amount of fuel over the engine I decided against checking for a spark with a spare plug. If I found one I'd have no eyebrows left ! A car was borrow for the trip to the club while I pondered the issue. Driving through the countryside the problem seemed very similar to the time I filled up with water from evil Sainsburys. The purple petrol was the clue. I had filled up a few days earlier, perhaps I had a tank of water or even red diesel. My carb cleaner can was empty but undeterred I decided to use WD40 instead as that's nearly as inflammable and every classic car owner has a can in the glove box. A quick blast in the carb followed by a run to the driver seat and I proved my point. The engine fired, not for long but it fired. A longer squirt and we fired again followed by a little bit of coughing and chugging and then the engine roared to life. So I think this is the problem - that Redex had sunk to the bottom of the petrol tank. Had I left it longer the treatment would doubtless disperse through the fuel. Better still if I treated it at the petrol station, the vibrations while driving would have mixed the two. I'll try and remember to do this next time. They should have thought of this when building the Titanic. At the boat club we have a harbour for our docking competition. It's quite high-tech for model boaters being made of plastic fascia boards floating on a network of drainage pipes. Or rather very slowly sinking. The push fit joints on the pipework aren't proving to be as water-tight as we'd hoped so the top of the harbour is level with the water surface. If nothing was done, this years docking challenge would be open to submarines only. So on April fools day a few of us hauled the harbour out of the water and flipped it upside down. Water was emptied out of the pipes and the everything securely re-assembled. Then holes were drilled in all the corners - not an obvious move when making things float unless you are drilling a hole in the bottom to let the water out again ! 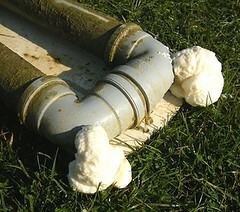 To keep the wet stuff out of the pipes we have filled them with something buoyant - expanding filler foam. I've used this stuff before so was given the job of foaming. I like to think that this is down to my expertise and not 'cos no one else wanted to get the stuff on their hands. Two cans were enough for our pipe network. As you can see the stuff oozed out of the holes as it expanded. Drying took around half an hour in the sun before the excess was pulled off and disposed off. It's noticeable that some of the pipes have developed a slight curve - probably caused by the air pressure in the middle as the foam at each end grew. Back afloat the harbour now sits on the surface which should make docking manoeuvres easier this year. Not good news really as I've won the last two tears. Perhaps I should have refused to help and built a submarine instead ? How about a nice break from this fiddly fine scale railway modelling ? Get out into the garden. Breath the fresh air and commune with nature. What better than making progress on the garden railway ? Well all I can say is it is b@**%y hard work ! The materials for the raised flowerbed, or baseboard to use conventional toy train terminology, were delivered a few days ago and I'd been using the Barclay loco as an excuse not to get my hands dirty. 96 concrete blocks had to be moved to the garden. By hand as there is no wheelbarrow access through the house. Then 24 bags of cement. Plus a dozen or so bags of sharp sand. The sand and gravel bags can stay out in the front and be brought through in buckets. A pile in the back is just too tempting for the local cats. I'm now looking at a trench with concrete (4 to 1 sand/gravel to cement) and thinking about laying blocks to hem in the earth. Quite how we lay the track I don't know yet but there is serious research going on as I speak with all the back numbers of Garden Rail Magazine that the Leamington & Warwick MRS posses. It's a lot more relaxing than mixing building materials !